The enhanced communication mechanism in OPC UA is smaller, simpler, faster, and makes it easy to embrace the huge world of IIoT applications. Unified Automation demonstrates the power of OPC UA technology on a self-balancing robot driven by an 8 bit MCU with only 2k SRAM. Kalchreuth, Germany, February 18th 2018. In the Industrial Internet of Things (IIoT), as well as in applications within the scope of Industrie 4.0, the computing power for communication tasks is typically large enough to run complex protocols and high encryption. However, in the area of the Internet of Things (IoT) typically low-end devices are used. These very cheap chips, 8Bit micro controllers, with limited memory and computing power require small and simple communication solutions. Furthermore, the use case is slightly different. In most cases data loss is not really a problem as long as the latest value comes through. Besides the existing Request/Response mechanism, which requires a "standing" connection between an OPC Client (data consumer) and an OPC Server (data provider), OPC UA was enhanced with an additional communication schema following the principals of Publish-Subscribe. In the Publish-Subscribe mechanism, a Publisher (OPC Server) sends its data connectionless to the network and Subscribers (OPC Clients) can use this data without the need for a resource-consuming connection. Unified Automation launched its High-Performance SDK nearly a year ago. This HP-SDK was developed with embedded use cases in mind. The HP-SDK pushed the use of OPC UA technology down to small embedded devices. UA Servers capable of the "Embedded Server Profile" could be based on CPUs in the range of ARM-M4 and the memory consumption was reduced down to 350k RAM. However, for a little sensor providing just few bytes of data, sitting on an 8Bit MCU this was still too big. But with the new UA Pub/Sub extension, a very light weight protocol based on UDP/IP, provides data consuming even less resources. Similar to the architecture in common IoT applications, i.e. like MQTT/Broker, the OPC UA Pub/Sub is used to push data from the sensor network to the OPC UA Server (broker) and from there on upwards to the cloud. To demonstrate the overall architecture Unified Automation showcased a self-balancing robot at this year’s Embedded World Exhibition in Nuremberg, Germany. Data from a six-axis gyro- and accelerometer (MPU6050) is sent via I2C bus to the Atmega328P, an 8Bit MCU with 2k SRAM, which is known as Arduino. Here the OPC UA Pub/Sub protocol is implemented and the UA Publish message is provided via UART connection to the ESP8266, a low-cost Wi-Fi Gateway. 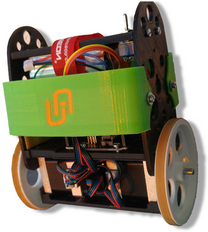 The self-balancing UaRobot sends the data wireless to a Laptop where it is collected, displayed, and analyzed. "This is another milestone in OPC UA technology", says Jürgen Boxberger, Executive Director at Unified Automation GmbH. "OPC UA Pub/Sub is simpler, smaller, and faster and hence qualifies for IoT applications. It plays in the same range as MQTT, but with the big difference that it directly integrates into the OPC UA eco system, with all its higher-level applications, industrial, and cloud-based solutions." The UA Pub/Sub Specification (Part 14) was finally released February 9th, 2018. The OPC UA SDK/Toolkit products of Unified Automation will be extendable with Pub/Sub-Add-on components. UA implementers will get their hands on this promising technology within this year. The OPC UA communication platform will reach out into new application areas, far beyond industrial automation only. The communication architecture of IT and OT has been united, and so does their field of application.